It's a truth rarely acknowledged that sludge legends Neurosis have turned their form of cathartic, elemental heaviness into something genuinely artistic. They haven't helped themselves with albums like Given To The Rising that redefine metallic weight and extremity, welding sharp-edged riffing to their emotionally-charged crescendos, albums that it is all too easy for mainstream commentators to reject as 'metal', with all their prejudices unsheathed. Idiotically, of course, as Neurosis have always rejected the form of beats-per-minute tech-death stat-ticking extremity in favour of music weighed down with emotion, a vital element that admittedly sometimes is forgotten by bands eager to prove themselves in a cutthroat market. 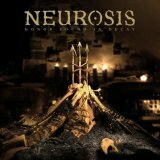 No-one asks Neurosis to prove themselves, however, not ten albums into their career, but they constantly do so and should be applauded for that. And applause is hard to restrain, listening to their tenth album, a step back from the sheer sonic heaviness of Given To The Rising. Honor Found In Decay rejects that in favour of a broader, more nuanced palette, building on the band's progressive credentials and making for a listen that rewards the patient with some of the best music of the year. Much more focused on the eye than the storm, Honor Found In Decay is all restraint, world-weariness, folksy acoustic strums and outsider instrumentation like bagpipes in a progressive piece of doom that but rarely features the band's usual wall-of-noise approach. If you want a word to sum the album up, that word is "contemplative", from title to music; this is an album of consideration, of quiet introspection. Perhaps it's that which has led to the accusations of Neurosis-by-numbers from some, who claim to find it almost boring. Madness, in my view, after spending some time with Honor Found In Decay, but in a career of ten albums accusations of repetition are inevitable. My interpretation is bound up in knowledge of that, the title that is so suggestive of a glorious downward slide ironic in that this is a glorious, glorious album. There is no slide into decay that I can detect, opener We All Rage In Gold proving the band's brand of aural anger is still of top quality with its groovy rocking and melodic meander, Von Till's ferocious yowl at odds with the almost beautiful backing. Neurosis prove themselves terrific songwriters from here alone, making music into a journey as ambience and doom riffage clash, with what sounds like a flute (but is actually a very good keyboard effect, apparently) riding high and lonely above the grinding guitars. Shades of side projects are summoned forth with the acoustic introduction to the then following At The Well, funereal clatter and droning riffage almost highlighting the point by the sheer contrast. It's the sound of dying, a mournful undercurrent loaned stubborn clinging life with the vocals, a surge in the guitars and slowly wailing keyboards, not to mention the upbeat closing with the flurry of vocal lines, tumbling over each other in a final explosion. When they do die, Neurosis will not go quietly. But who would want them to, when they create moments of such unsettling beauty as that on My Heart For Deliverance, where stoner grumbles become streaks of psychedelia? Astonishingly fragile vocal asides clash with sneering yowls, guitars devolve to simple, gorgeous melodies that touch the heart like the best post-rock, and yet the band say more with a single piano key and a sample than any of the legions of pretenders can with whole albums. Lovely droning instrumental sludge flows for minutes after and holds your attention with sheer tunefulness, a song that breezes through its eleven-minute plus length before you notice the time has gone. Personally, I hope for another ten albums from the band on the strength of this alone, as if the whole album wasn't an all-encompassing argument for the band's beautification. The tribal pitter-pattering of Bleeding The Pigs, one moment calm, the next harrowing and ominous; the soft Americana of Casting Of The Ages' modern yet ancient folk, given edge and bite with riffs and soul-caressing drone. Strident doom metal rings out proudly on All Is Found... In Time, slowing and growing softer as if with age, buzzing noisily towards the end as if possessed by the spirit of High On Fire, whilst finale Raise The Dawn turns to woozy psychedelia, a fiddle behind the clamour coming to the fore almost unaccompanied, the sound of the past setting the stage for the future. The best description I've heard of all this is one I've borrowed from a Pitchfork writer: Johnny Cash with an arsenal of electric guitars. Honor Found In Decay has that timeless, classic feel that ensures it will be listened to in ten, twenty years' time with the same respect as it gets from me now. A very, very late entry to my year-end best of list, but one that wholeheartedly deserves its place. It's yet another gem in the discography of a tremendous band, and a must-listen. Art.